Do you have any special needs? Send us a request, our technical office will contact you to give you all the information you need. Requirement: machining of high-strength materials for the automotive and agricultural machinery sectors. A large factory for producing continuous coils of 13 mm thickness, and ensuring constant continuity and reliability. Straightening using constant-power rolls, as well as the rigidity of the entire plant. Flat sheets, perfect for a mould of impeccable quality. Solution: a plant designed for sheet thicknesses from 3 mm to 13 mm, with a straightener, supplied through an exceptionally strong structure, built using welded ST52.2 steel and mounted on a canted base that allows for vertical adjustment. 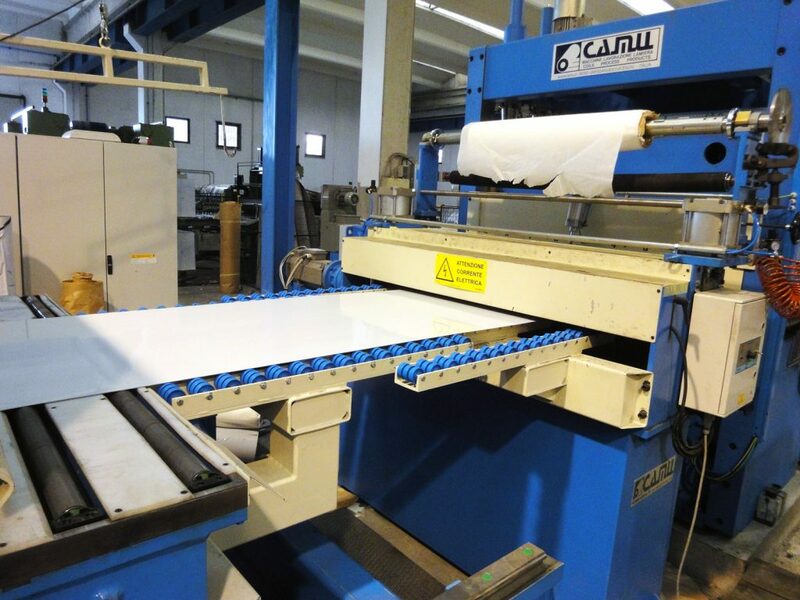 The horizontal adjustment of the sheets, both at the input and output of the straightener, allows alignment of the sheets using position indicators and a bank of counter-rollers. Benefits: ease of use, and low maintenance for the highest possible productivity. 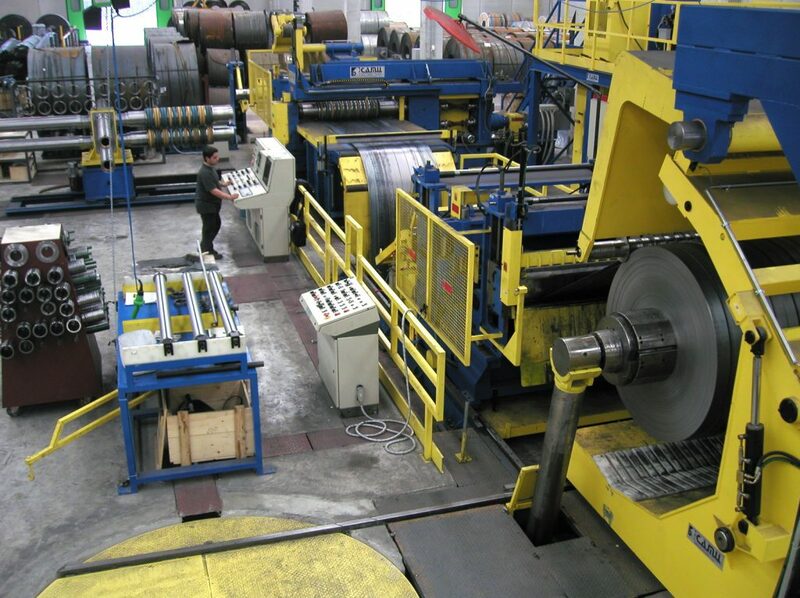 Requirement: a robust, efficient and simple line for slitting hot-rolled, pickled and cold-rolled sheet metal coils. A plant that could guarantee high efficiency and productivity, the reduction of dead times and improvement of working conditions. Solution: a slitting line for 1600 x 6.35 mm strips with mobile braking carriage and automatic blades change in just 4 minutes. 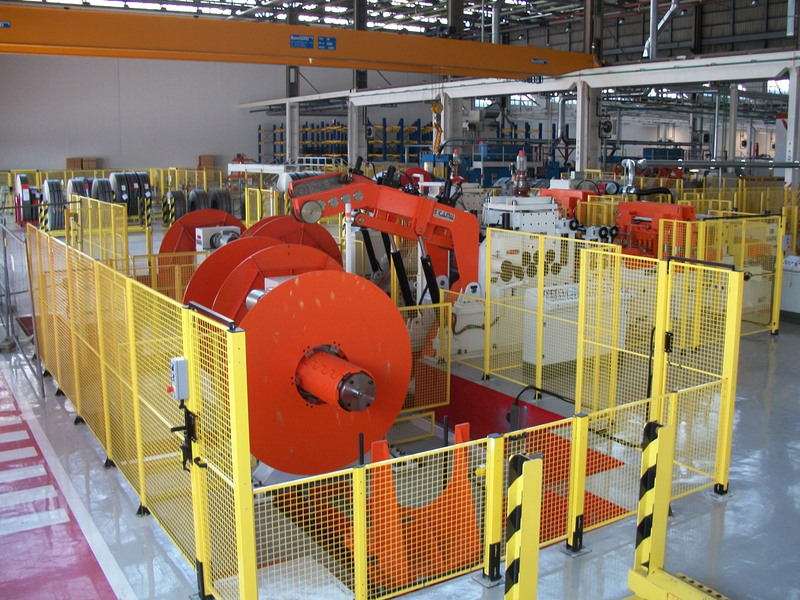 A unit for blades-changing off-line, for the assembly and preparation of the next cutting program while the plant is running, permits dead times to be reduced. The inclusion of a storage ramp for up to three 30-tonne coils makes the plant highly productive. Particular attention has been paid to the design of the infeed and stretching unit in order to remove the elastic stresses and the deformations in the form of the coil up to the recoiler. A simple, robust, reliable, productive line at a reasonable cost. Benefits: maximum flexibility and productivity, and maximum ease of operation given the availability of all the expedients necessary for allowing the operator to have every operation within reach with ease. Requirement: the stainless steel service centre’s aim was to be able to supply even small customers with materials within a maximum of two days, with the requested measurements and in accordance with specific needs. The expressed desire was to be able to have a plant that would differ from those seen in other centres, a plant that would make a further step forward. Solution: close collaboration with the customer led to the study of a specific technical solution including a 7,000 mm double-pallet stacker that allowed the production of non-standard formats with great speed. 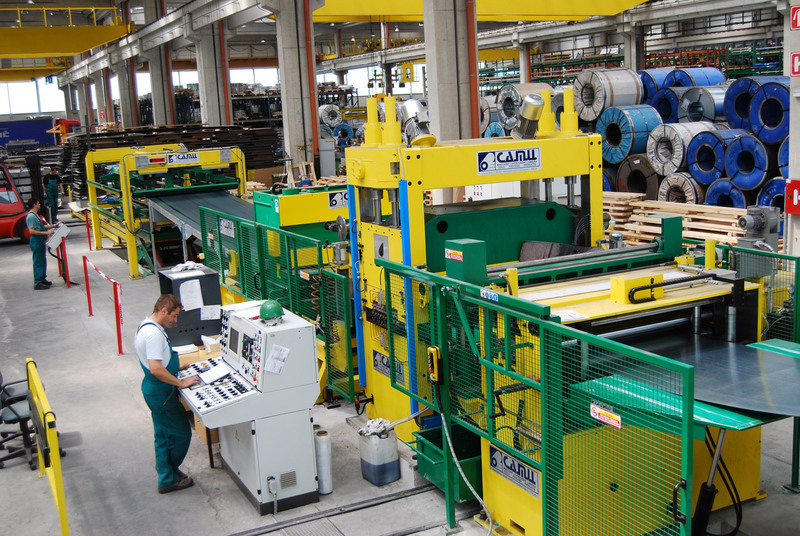 A high-quality plant for levelling thickness from 0.5 to 3 mm with small formats and up to 7000 mm, capable of machining any coil type while obtaining great flatness at all times in which a defined roller diameter and interaxis ratio, structural rigidity and flexibility of movement have made it possible to obtain extremely high performance, all in combination with a flying shear. Benefits: thanks to the plant’s high productivity and flexibility, the service centre is able to satisfy its own clientele. Requirement: an extremely flexible and versatile line for machining small and diversified batches of sheet metal, prevalently cold-rolled, prepainted and in stainless steel. Equally important was being able to pass quickly from one batch to the next in the briefest time possible. Solution: a 1500 x 3 mm cut-to-length line with 19-rolls leveller, 7 rows of backup-rolls and a flying shear. The winning technical solution was to make the cut material run on two conveyor belts with different speeds to space the sheet and permit the levitation movements and opening of the guides of the aerial stacker. The packing operations were optimized and correct stacking was obtained. Benefits: every work stage was optimized in terms of speed of execution and global cycle economy as requested by the customer. 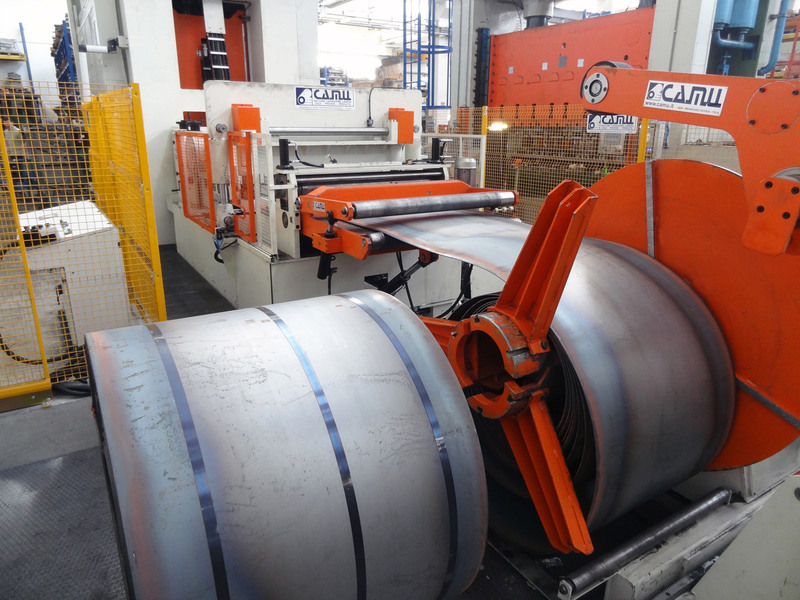 Requirement: high-strength material, dry and resistant to cutting (R= 800 N/mm2); the technical and business objectives of the plant for feeding the sheets to the roll forming lines were to obtain perfect flatness and stretching of the coil to eliminate residual stresses, low coil preparation times, great efficiency, functionality and reliability over time. Solution: noting that the coils were inserted frequently, the initial studies indicated the need to envisage the automation of the coil loading functions as well as careful selection of the components in order to ensure rigidity and a constant counter-pull during the levelling stage. The straightener is the heart of the plant and it is possible to make all the adjustments and corrections necessary, from the thickness to the cross and horizontal unevennesses in the coil. The automatic group for joining the coils is positioned after the straightener, and is composed of: head and tail shearing of the coils, positioning, mating and aligning the two ends of coils for welding and measuring the width and thickness of the coil. Benefits: thanks to the high automation level with the maximum integration of the plant controller’s activity, the productivity of the line could not be higher and there are no manual operations.